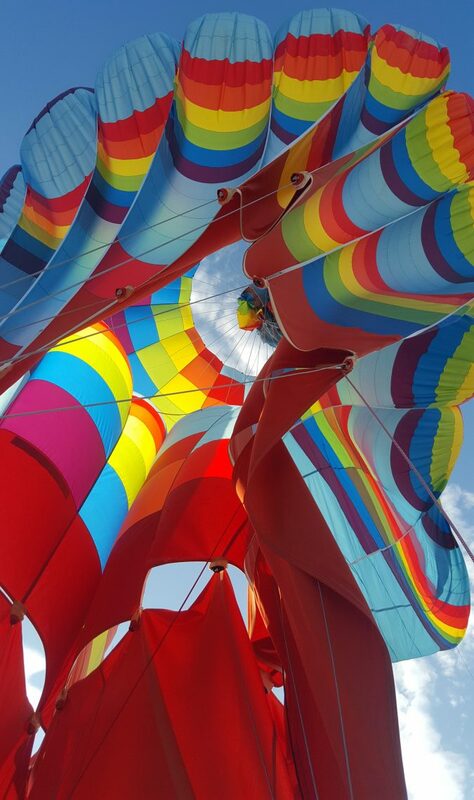 I had always considered a hot air balloon flight as something cool… done by others! After all, I didn’t get on an airplane until I “had to” to go visit my fiance (who is now wife…) since she lived on the other side of the Atlantic. 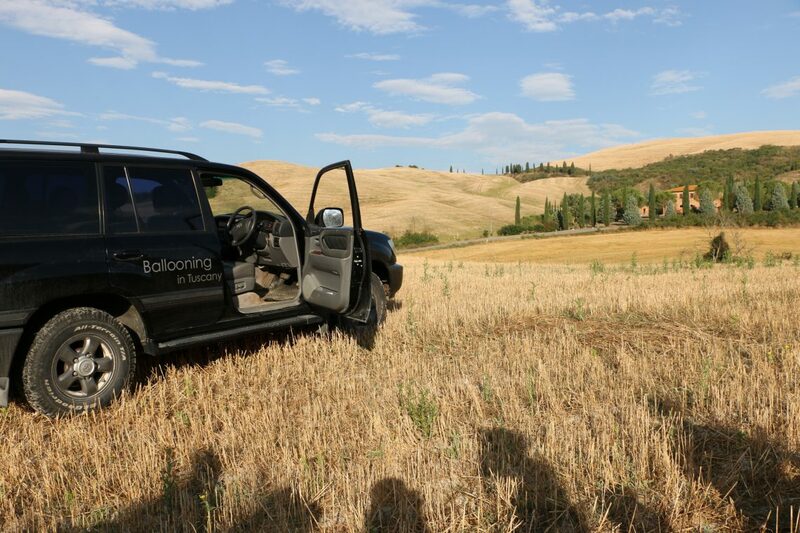 Then we got an email from Annie from Balloning in Tuscany, one of the top operators in this area. 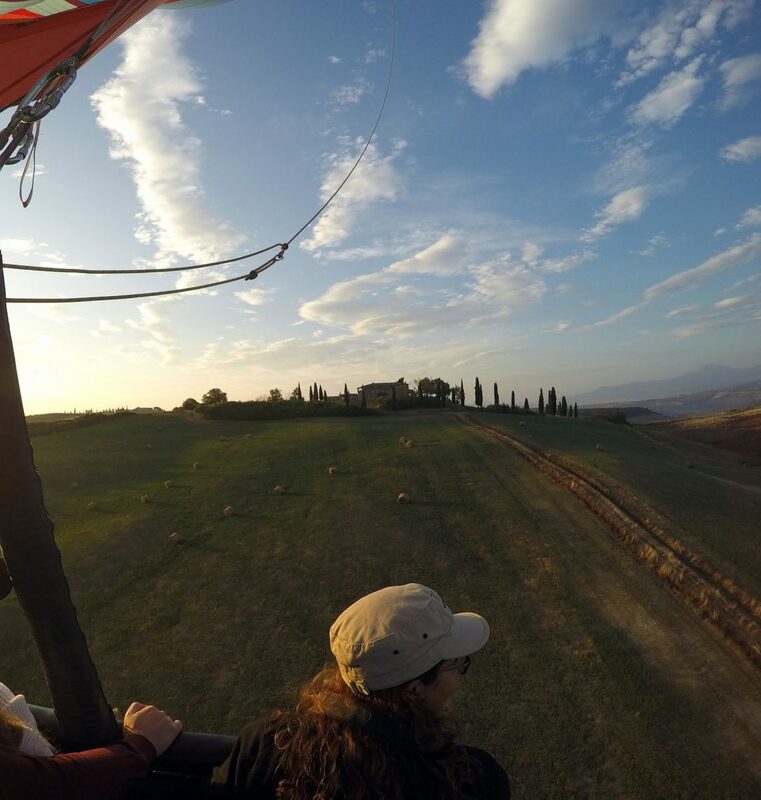 She was inviting us to come try out a flight in one of their hot air balloons over the Val d’Orcia area in southern Tuscany, considered as one of the most iconic of and charming in all of Tuscany, and see it as the birds do. My wife Lourdes and I looked at each other and in a blink of the eye decided it was an opportunity we couldn’t miss out on! 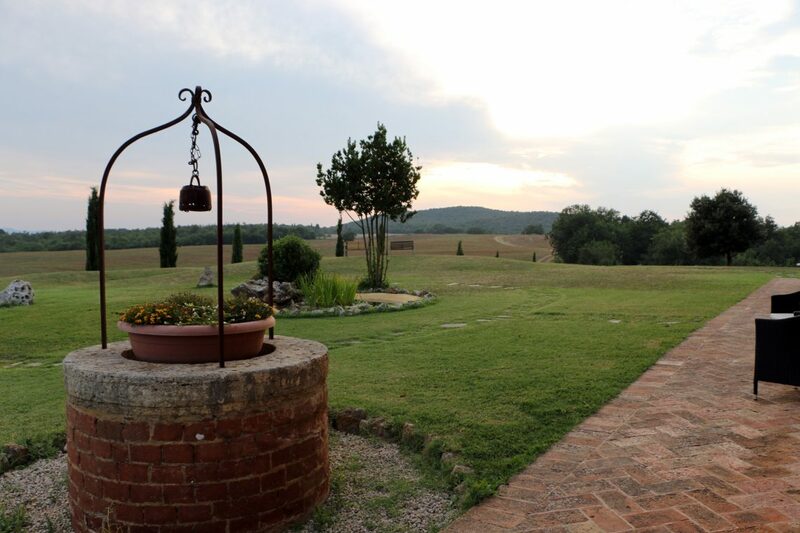 Departure is from just outside Montisi, near both Pienza and San Quirico d’Orcia. The meeting time is at dawn (often at 6am during the summer, but can vary upon the day’s weather forecast) because at that hour there are no thermal currents that could cause problems during the flight. We must therefore get up super early but are sure it will be worth it! 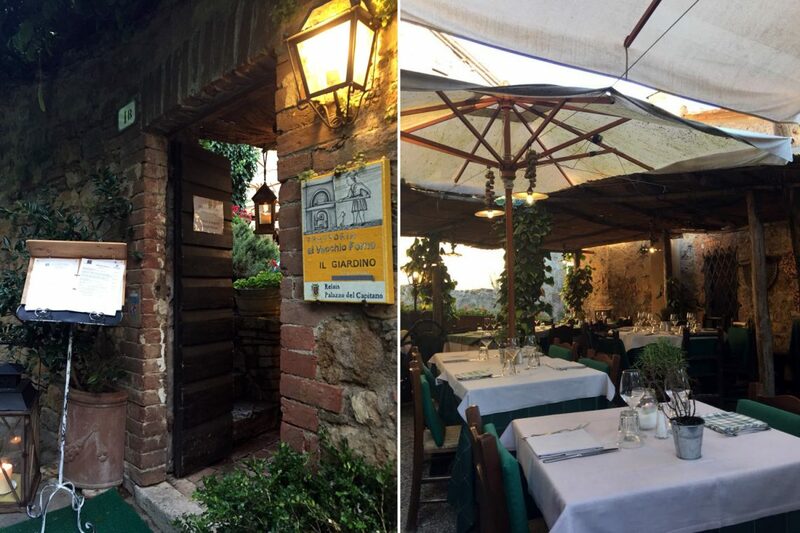 We realize we can’t drive down from Florence the morning of the flight unless we don’t want to sleep so decide to drive down the day before and stay locally, finding the Locanda Vesuna is just a few kilometers away from the launch site. 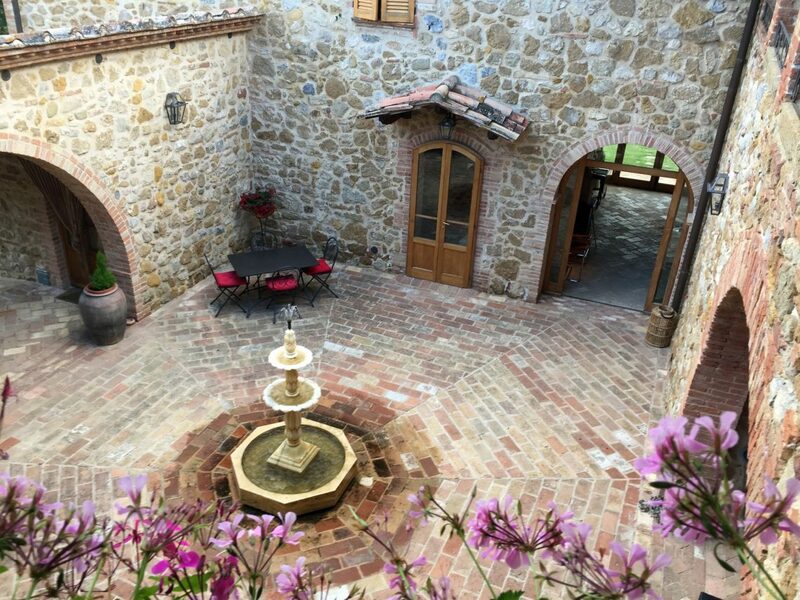 Upon arrival at the Locanda, we are welcomed by both Luca and Regina, the couple that manage the place, and by the beauty of the Val d’Orcia which can be admired in every single direction we look! We understand right away that to sleep here for the one night, with the early morning departure, is a bit of a waste. It is such a beautiful place, with romantic spots everywhere you look as well as open spaces and areas that are perfect for families with children, too. Built in rock and completely renewed this year (just reopened after several years of closure), the property belongs to the Italian showman and chef Marco Columbro, who uses it as is summer getaway. The Lavanda Room we are given is spacious and comfortable, furnished in a rustic style and with a large bathroom. We would have liked to sample the on-site restaurant, but due to unforeseen organizational problems, our dinner was cancelled. They help us book at the Trattoria Toscana “Al Vecchio Forno” in San Quirico d’Orcia where we enjoyed an excellent dinner (with several options for vegetarians) where we sampled, and thus recommend, the extra “off menu” dishes that are made with fresh porcini mushrooms. Luca is friendly and chats with us about our planned early-morning adventure, and then gets up and prepares our breakfast at 5:15am (a very special circumstance as he doesn’t normally do this). 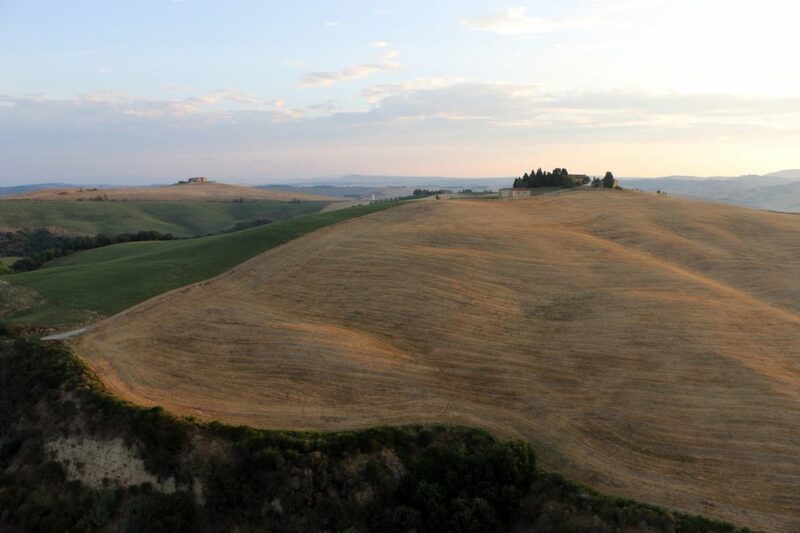 We don’t really want to leave Locanda Vesuna, but are certain our next stay in the Val d’Orcia will bring us back here! 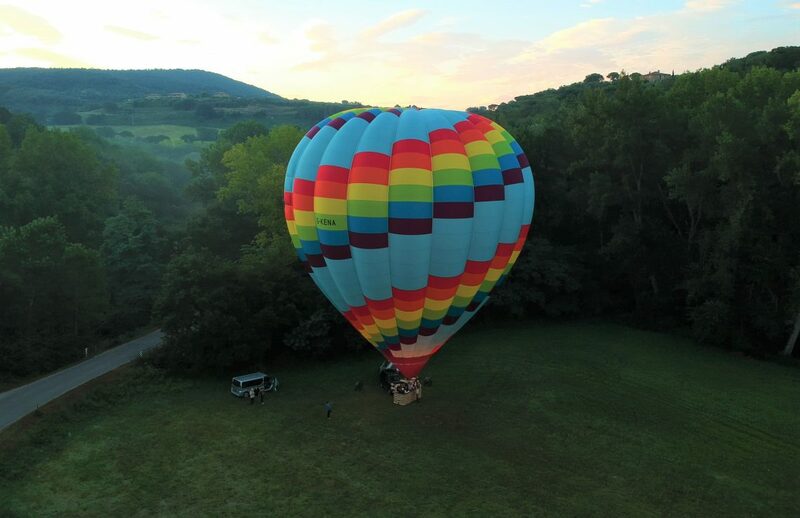 We must be very punctual in getting to the meeting point at the assigned time because we do not want to miss the hot air balloon being inflated! Being on time is also very important, since if you’re more than half an hour late, the balloon would take off without us…. 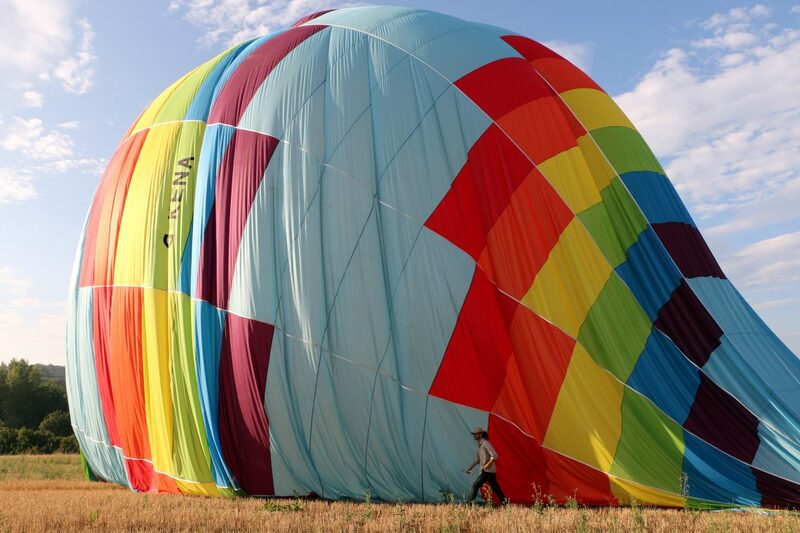 once the balloon is full and ready, it cannot wait for anyone who’s late. In the area, both GPS and cellphone reception is not great but from the Locanda we take the road to Montisi and in less than 15 minutes find the meeting point, easy to see after a curve as there is both a large sign indicating to turn right to park and there are already several people there by the road! We finally personally meet Annie, then our pilot Nick and the rest of the team, as well as the other passengers on this early morning’s flight in August. 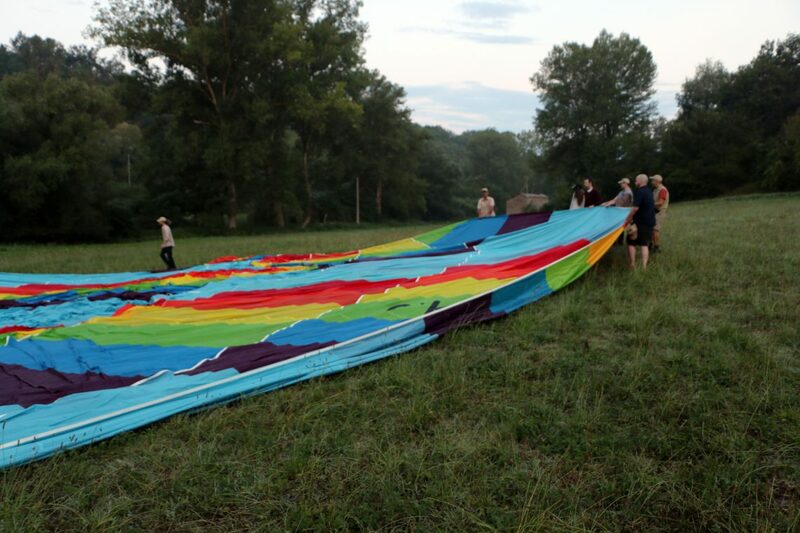 Right away, we are involved in the preparations for inflating the hot air balloon, which is enormous since it will take 12 people up. 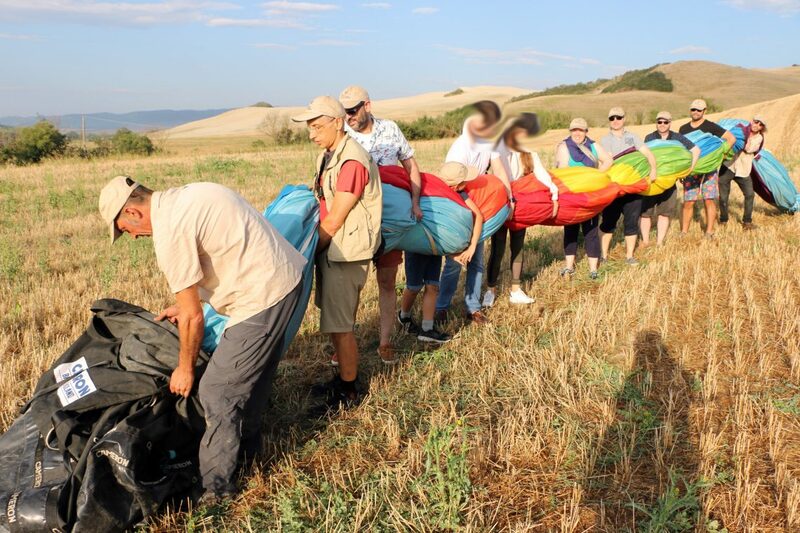 The flight for the day is full, but there can be times when there are less participants, and having several balloons means they adapt to the group size as well as offering the possibility to book private flights for smaller groups. 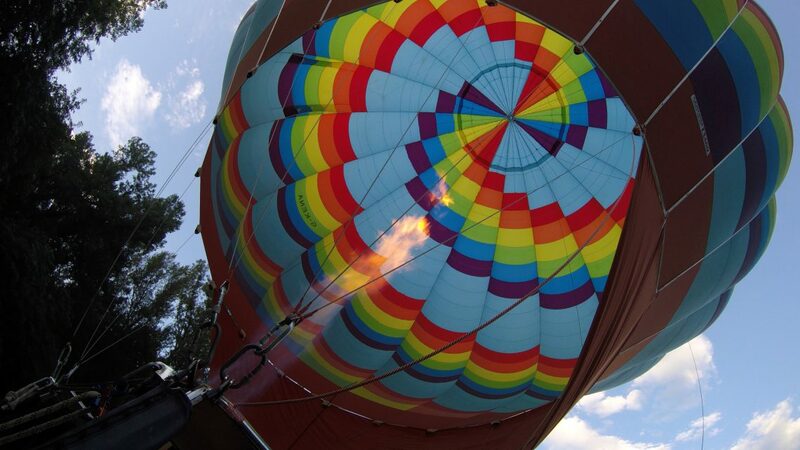 Together with another of the passengers, I help open up the mouth of the balloon while two huge and powerful fans blow air into the balloon, the air is then heated up with what is a huge gas torch. 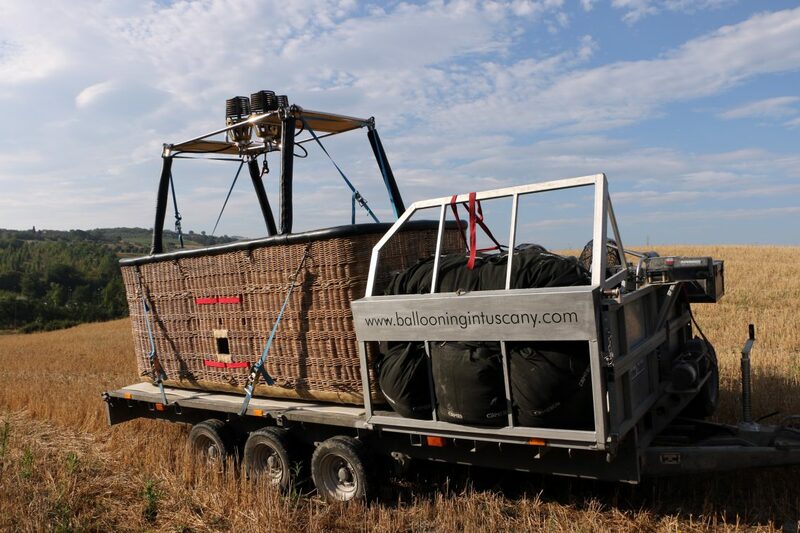 After a short bit of time – considering the size of the balloon – the hot air balloon begins to rise, full of warm air now and the large basket which will carry us which was laying its size next to the balloon rights itself and gets positioned under it. 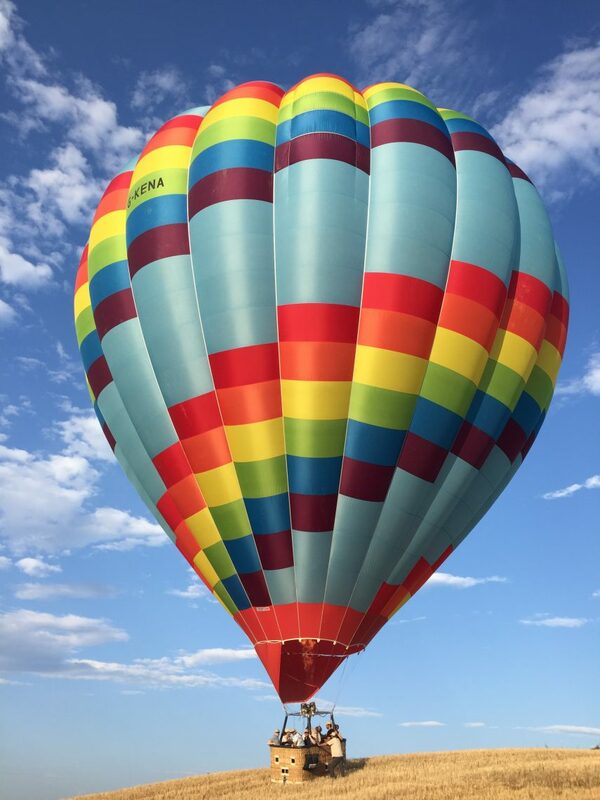 Nick, who’s a a very nice fellow, is very reassuring and we can tell he has the competence in this area of hot air balloon flying. 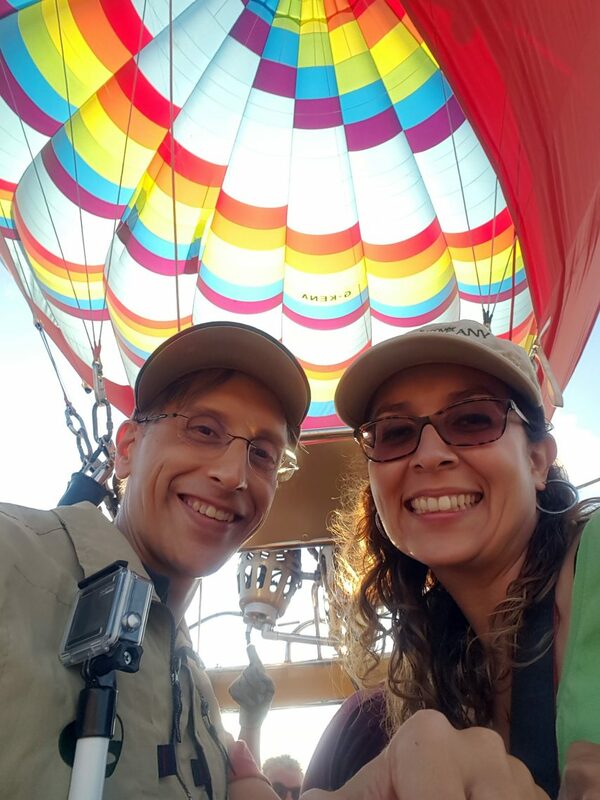 In fact, we later find out he has piloted countless balloons in his over 30 years of being a pilot so we know he is truly passionate about his job. He also explains that once we’re in the air that it is the wind that decides where we go for the morning. He can decide the elevation at which we should be, since a higher elevation generally corresponds to a stronger wind and thus faster speeds. 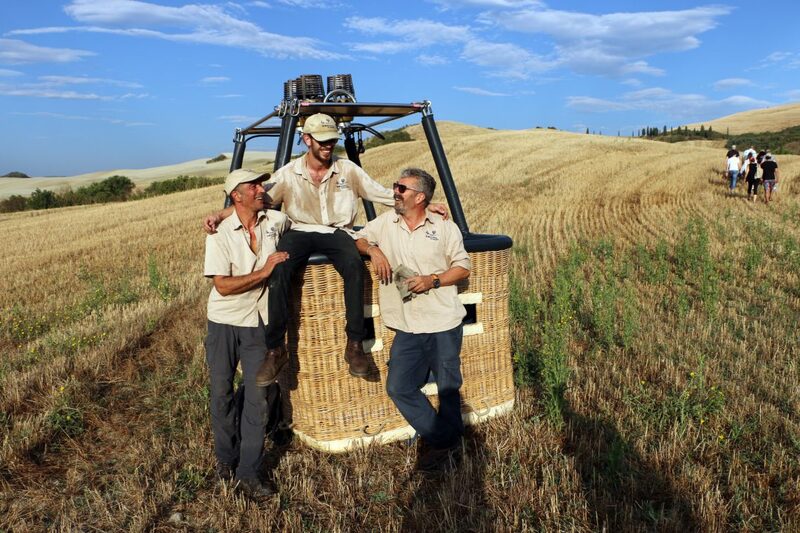 But it isn’t possible to decide the direction, and after a certain amount of flight time, he will start looking out for an appropriate landing area, often one of the many fields in the Val d’Orcia, and that’s where we will set down. We will be followed, with GPS, by a support van who will meet and take us and the balloon back to our starting point. 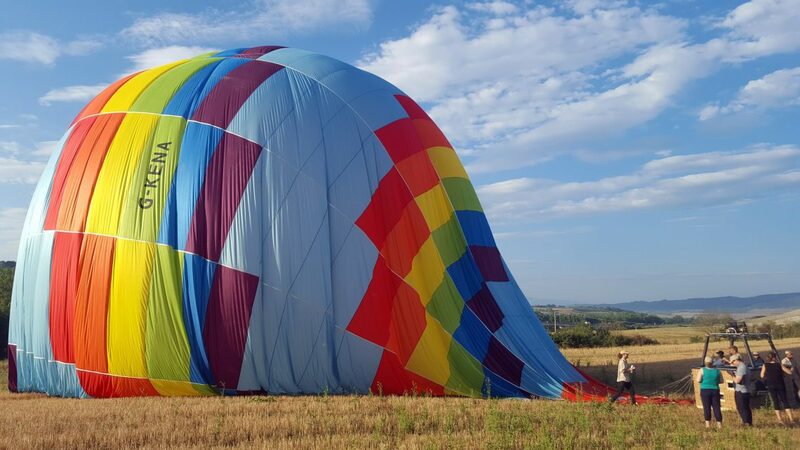 With the balloon standing, it is now time to get into the large wicker basket: there are several small square holes on the sides decided to help us climb up. We check and have all of our cameras ready, dressed in layers in case it gets chilly (but on this summer morning there is no need…). The gas burners start to burn the gas more intensely and the air inside gets warmer, as the balloon completes getting full. It slowly starts to rise from the ground, gradually and in silence, with only the sound of the burners, turned on and off at intervals by our pilot. We see an early morning cyclist stop and watch us take off. Little by little we reach the first rays of sun peaking over nearby hills since dawn hasn’t completely broken, and the horizon opens up before our eyes. We start seeing small clusters of homes and then villages, fields and towns. It is almost an unreal show, with so much beauty opening up before our eyes, and the silence at which we are moving up. We are so used to always move with the background noise of a motor of some kind that this quiet makes the experience even more magical. The views you can enjoy and the emotions we feel bubble up during the hour of flight are actually difficult to describe. Only after will I actually realize that there was not even a single moment of anxiety or fear during the entire flight. Not even one jolt or sign of turbulence, as we gently rise and go down guided by Nick’s experts hands as we moved with the wind (although he was telling us the wind was stronger than usual, we could not feel it inside the balloon). 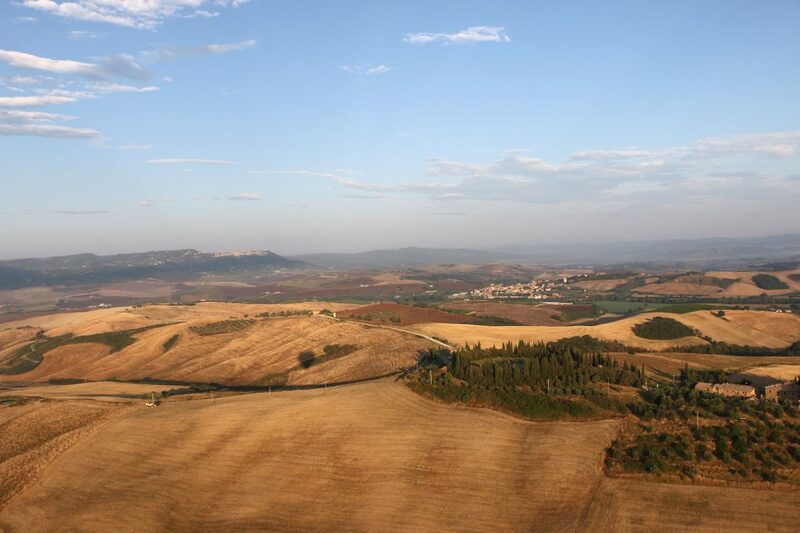 We admire the view of Pienza, Montepulciano, and the gorgeous views of the Val d’Orcia with its many fields and August colors. Below us, we see many deer that look up wondering where we came from and then quickly run away to hide. Better than words should be the many photos we took to try to give you an idea of the spectacular views you can enjoy during the flights. At a certain point Nick took us down to graze some treetops: close to the ground, the wind was almost non-existent so we almost stand still, suspended a few meters above ground and enjoy some of our last aerial views. Nick has spotted an appropriate landing field a bit ahead and after about an hour of flight we prepare to return to earth. Our landing is so gentle it isn’t even necessary to get into landing position, just grab onto some handles inside. I was expecting a bump or two but was disappointed. 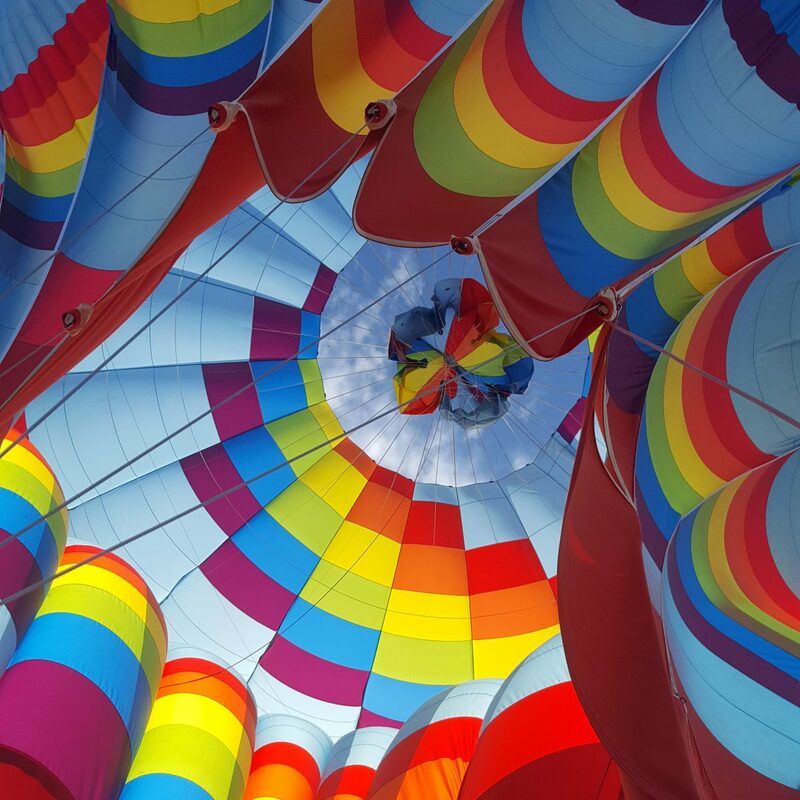 It is quite spectacular to also see, from inside of the basket, the top of the balloon open up to let the hot air escape and thus begin the process of deflating and packing up of the balloon. 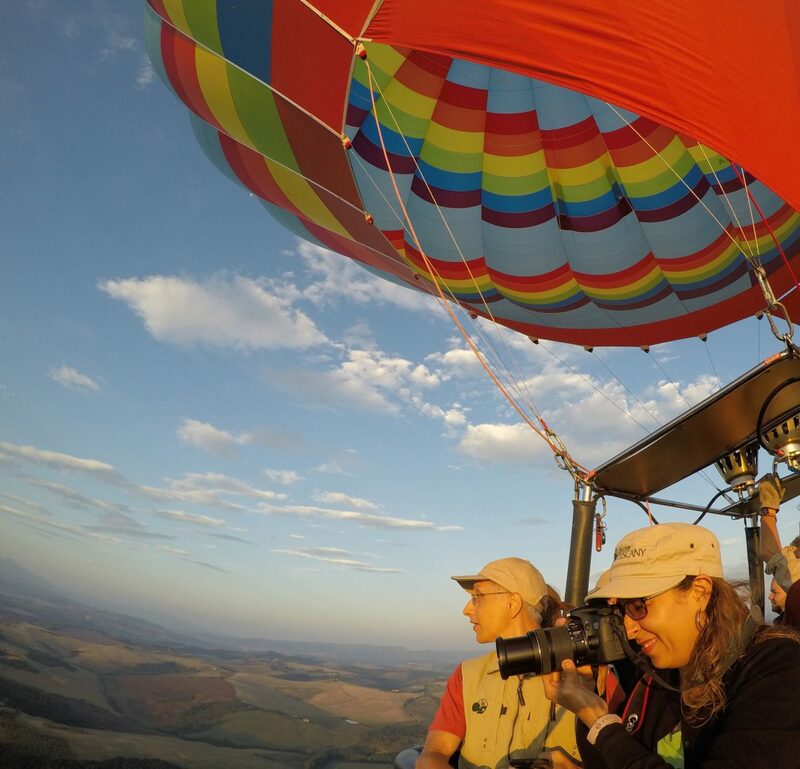 During this time we are able to chat with each other, as well as learn several interesting anecdotes and details on hot air ballooning. 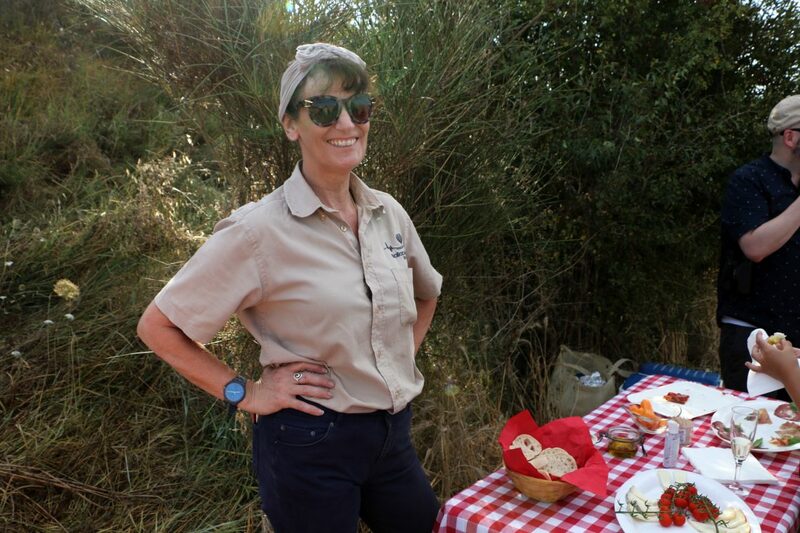 The entire tour is conducted in English and they are used to working with people from all backgrounds, so even I, a non-native English speaker, have no problem in chatting with everyone. 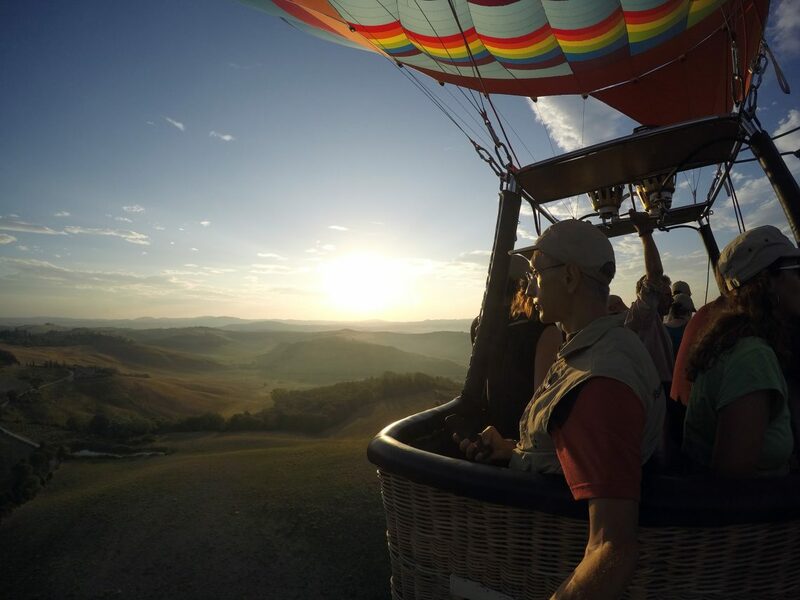 We discover, for example, why it is a token of good luck to always bring a bottle of sparkly aboard to drink at the end and that flying in a hot air balloon is statistically the safest way to fly, much more than by airplane. 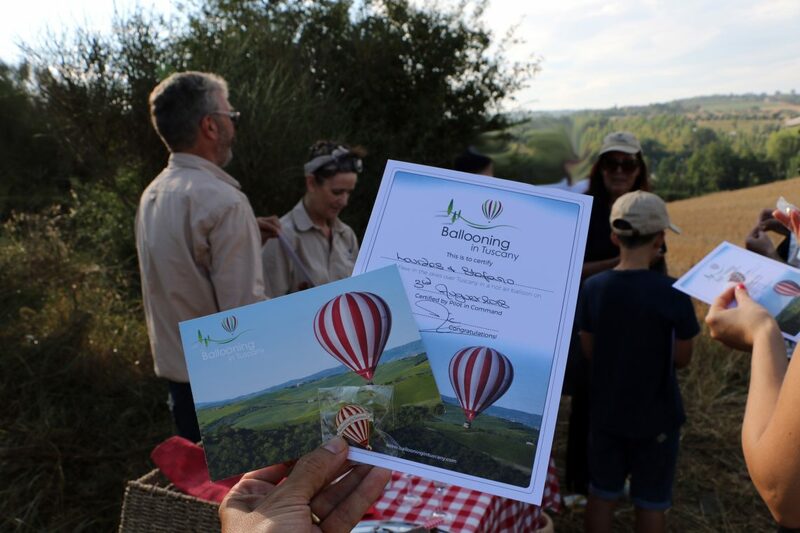 All of the Ballooning staff are kind and friendly and super professional, it was a pleasure to be in their company as well as the other participants. Without being in a hurry, once the breakfast is over, we get on the van that takes us back to our meeting point and our car. 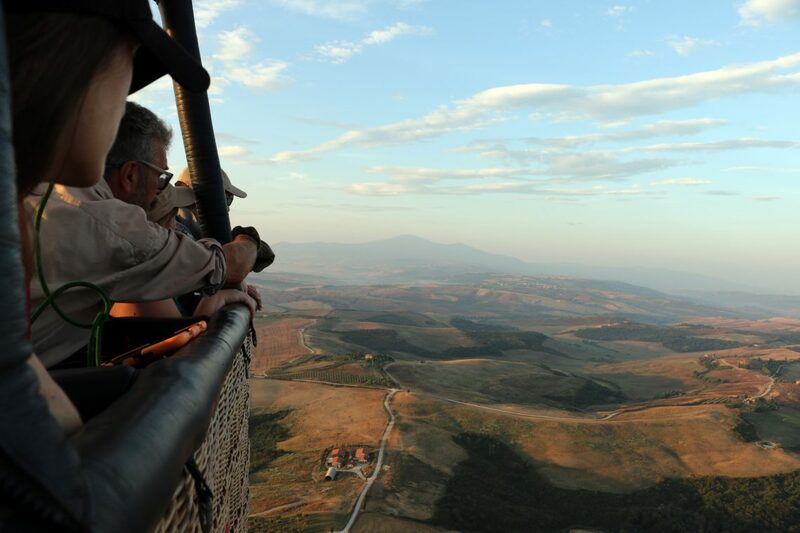 The entire experience lasted about 3 hours and is very well organized, extremely fun and particularly spectacular during the flight with the unique bird’s view we were given. 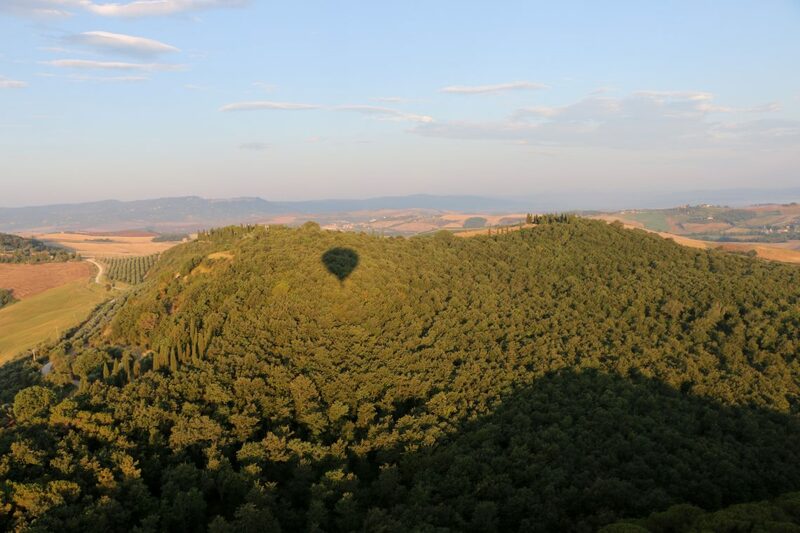 We offer a humongous thank you to Ballooning in Tuscany for inviting us to take part in this unique experience, one we likely always have left for “some day”. 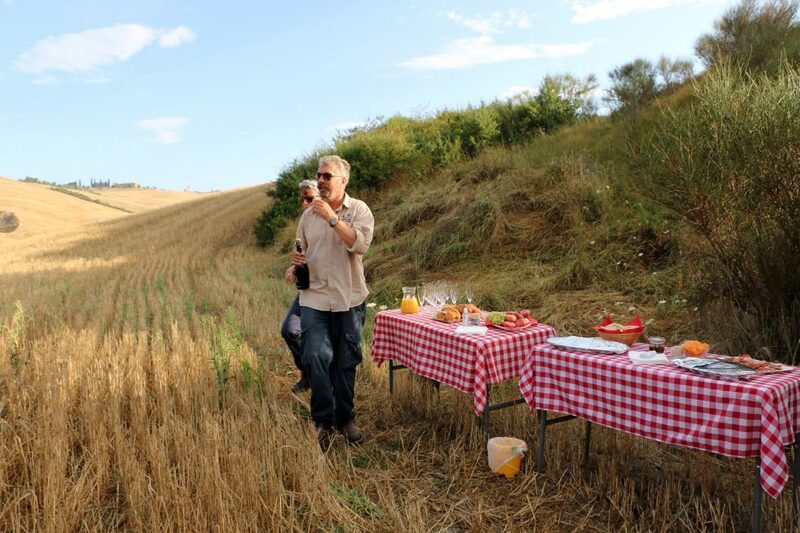 Now we are filled with the desire to repeat it soon, maybe from another location (they do flights over the Avignonesi winery near Cortona and are waiting for permits to fly over the city of Siena). A farewell to all – we are sure it is just a “see you soon” – and by 10am we are in Montisi drinking a coffee at the Barrino café :-).